Inside the dining room at Ouest. Over the weekend the missus and I indulged in a bit of decadence by stopping in at Tom Valenti’s Ouest restaurant on Broadway and 83rd. For $28 per person, you can indulge in a two course brunch with a cocktail. For the quality of the food involved, it’s a pretty good deal. 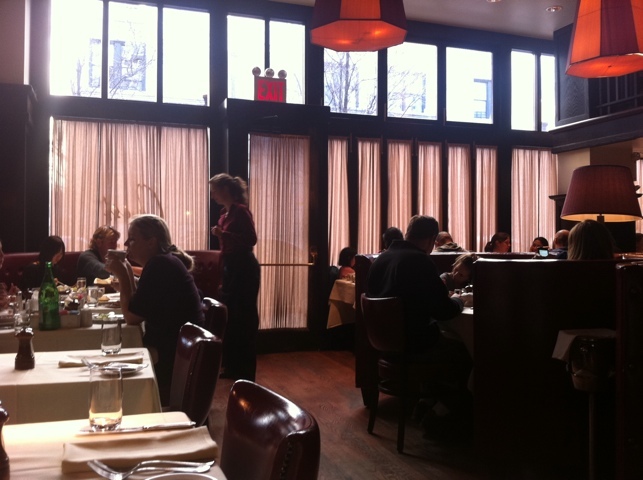 Although we arrived late in the day for brunch – close to 2:00 – the place was packed. I realize in the picture above you can see some empty tables, but the dining room when we first walked in was so busy they opened an otherwise closed area for my wife and I. We didn’t care for the balcony seating – it was hot, cramped, and a bit isolated – so we offered to wait until something in the main dining room opened up. A table of six cleared out shortly thereafter, hence the empty tables you see. All that said, there was some gregor – and quite a few kids – in the dining room. 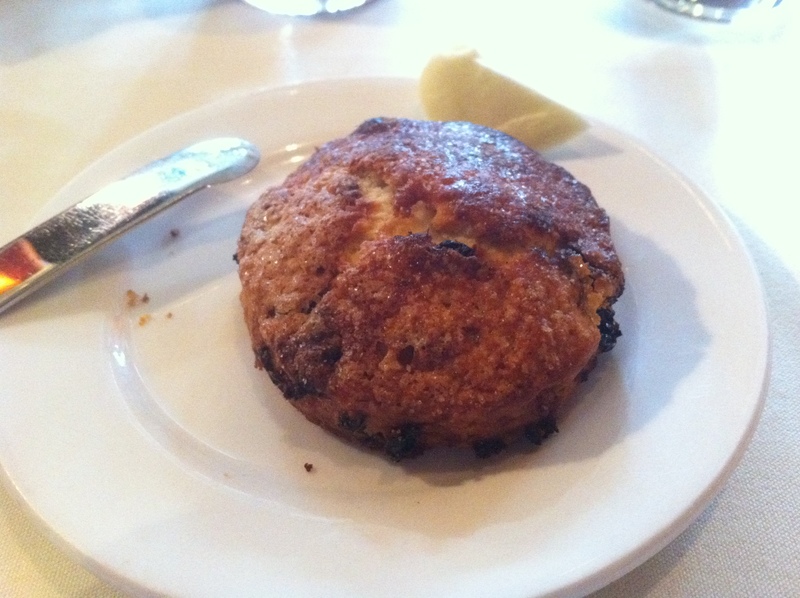 A warm, fluffy, crumbly scone. Lentil soup. Not much to look at, but rich. I started with a lentil soup with bacon. It wasn’t very pretty. The broth wasn’t prepared in the thick fashion. Rather it was a bit thin in appearance, with creme fraiche and chives. The creme fraiche arrived in narrow, clotted pours which resulted in what you see above when stirred up. Despite its appearance, it was incredibly savory. It packed a good onion note and a slight salt. 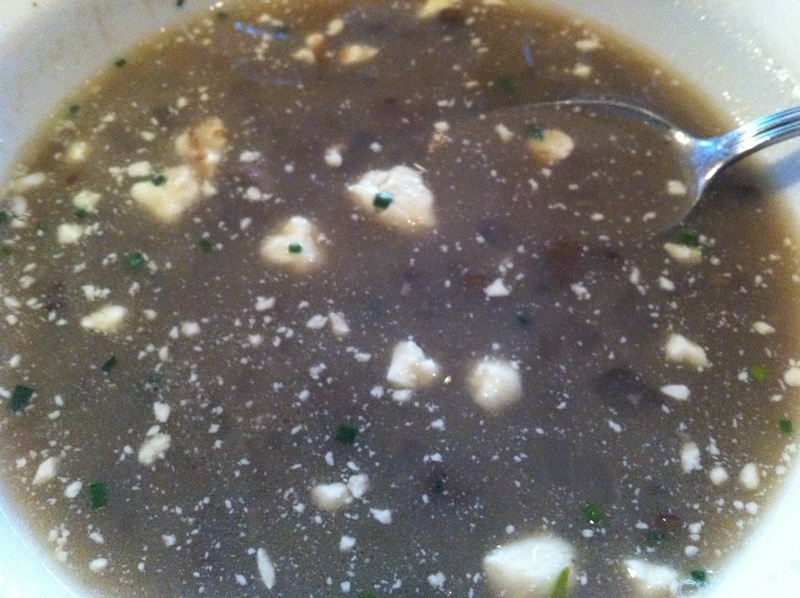 The creme fraiche and chives fattened the flavor up. The non-traditional salmon. Sour, delicious. Just look at the pretty presentation of the non-traditional salmon. Lovely, no? 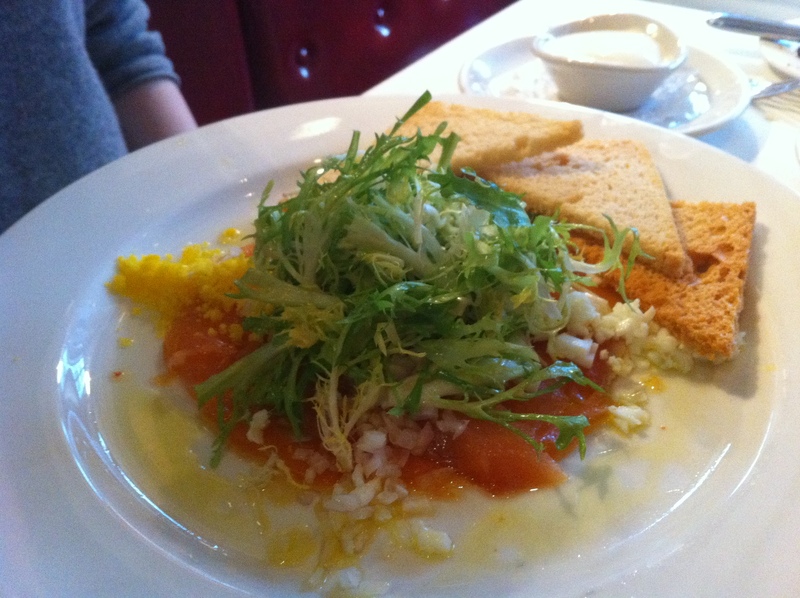 Unlike most smoked salmon, which can be very rich, this seemed to be more of the pickled variety, on the sour side. The onions help cut through the intensity, as did the nice bevy of greens. Not pictured there is a clutch of capers that lie beneath the greens, which rounded out the flavor very nicely – especially since I am ordinarily not much of a fan of capers. Although my wife ordered this dish, I wound up eating much of it. 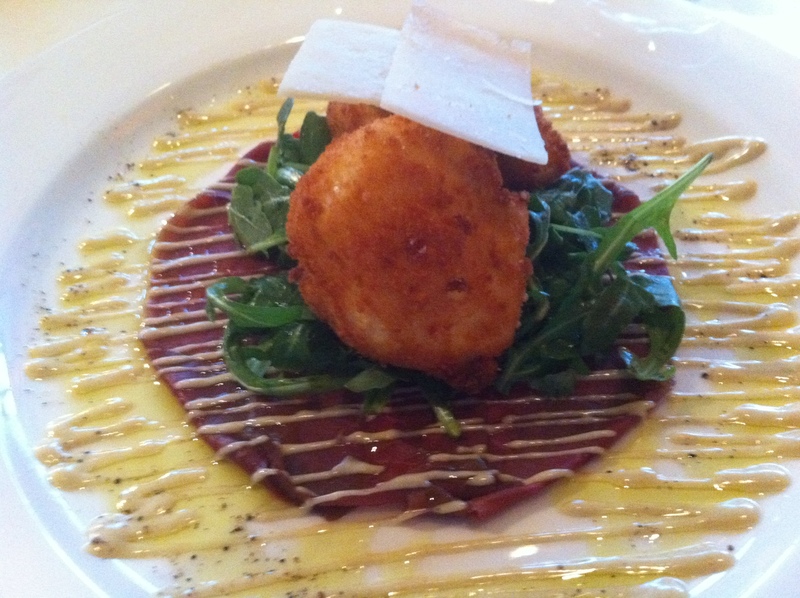 The extremely decadent fried poached egg over duck carpaccio. That ridiculous work of art above is the fried poached egg. I know, it makes no sense to me either, but yowza, it is incredibly decadent. It rests on a duck carpaccio. Drizzled across is a sauce which I took to be basically a kind of hummus (unconfirmed). Resting atop are slivers of parmesan. I really can’t fathom the skill involved in creating a soft-poached egg and deep frying it only to retain the excellent runny interior when it is brought to the table. Maybe some chefs out there will tell me I am easily impressed with parlor tricks, but guess what: I am. But on to the flavor. The fried poached exterior was surprisingly thick and crunchy, more like the hard bark around some beer battered onion rings than the lighter glazing I was expecting. It is very, very decadent. The egg is succulent. 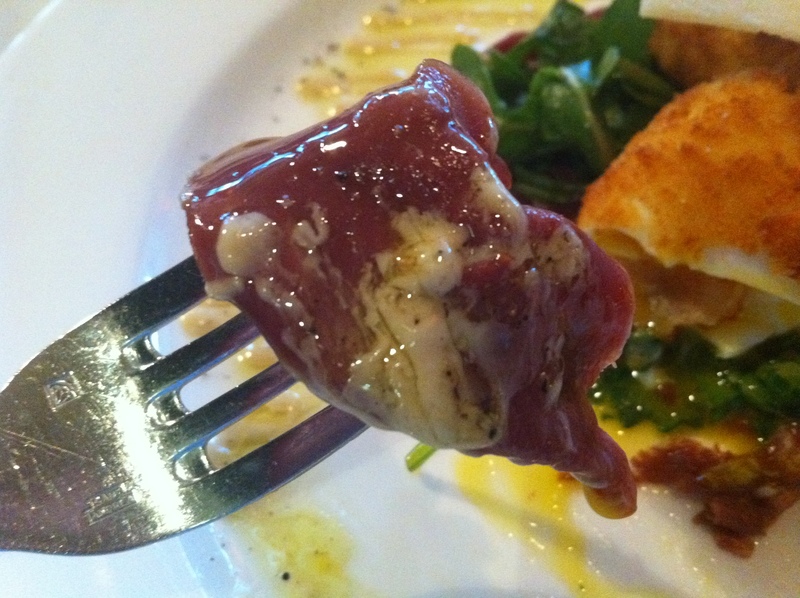 The duck carpaccio was more akin to prosciutto. 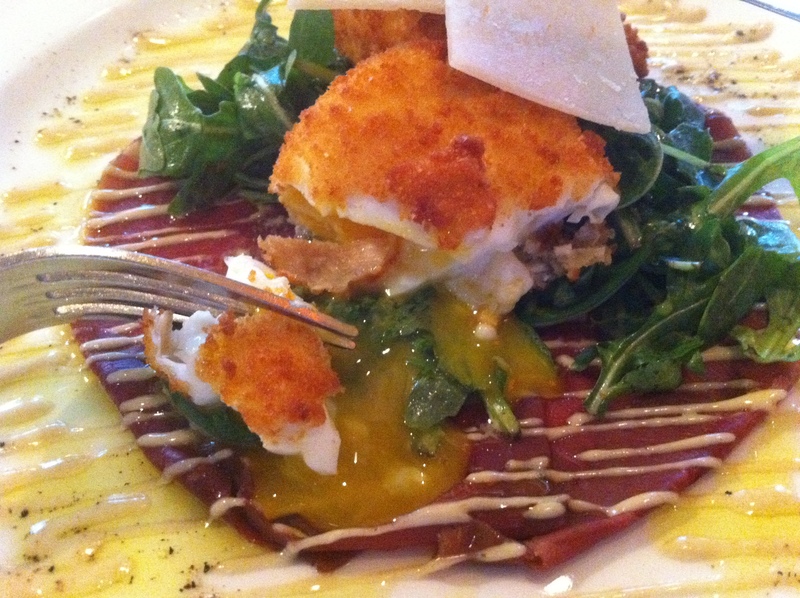 The duck carpaccio the egg rested on was more like prosciutto in texture and flavor. The greens added a welcome zest. All in all, it was a very rich meal, and a lovely brunch. Get directions – Is this accurate?